Fonon’s Board of Directors approves “2015 Reorganization Plan” outlining transition from Development to Growth Stage Company. Lake Mary, Florida, September 10th, 2015 (GLOBE NEWSWIRE)—Fonon Corporation (‘Fonon’) (OTCBB: FNON) is pleased to announce the company’s “2015 Reorganization Plan” aimed at creating shareholder value and increasing the market cap. Acquisitions/mergers of revenue generating assets and high-value hard assets for sustainable operations in multiple markets including medical, automotive, aerospace, defense, space and energy sectors. Uplift the company into major stock exchange while growing shareholder base with goal of declaring dividends in 2016. Capitalize company by securing funding through financial instruments like IPO/SPO creating bases for transition into long-term sustainable growth. Grow share in a global market of additive manufacturing (AM) and subtractive manufacturing (SM) systems providing the industry’s largest array of material processing equipment. Expand global sales channels to support growing customer base. Secure and expand manufacturing facility aligned with strategic growth plans. 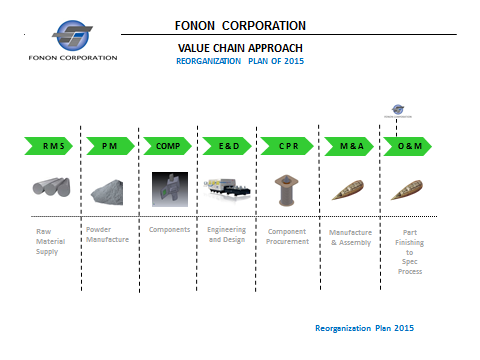 Fonon’s Value Chain model takes into account its full range of activities (raw materials, components, design, production, marketing, distribution and financing) tailoring its products and services to meet the needs of new and existing customers. Fonon Corporation is aggressively pursuing potential mergers and acquisitions that support the company’s Value Chain model from raw materials, components, subassemblies and machines that meet the full range of products of our global customer base.